Vancouver – Smoking Gun Interactive Inc. a premier independent video game studio announced today that it is collaborating with the award-winning writer Douglas Rushkoff for the story of its as-of-yet undisclosed new property. Rushkoff will work closely with the team at Smoking Gun, to develop story narratives across a range of media formats that can feed off one another and exist concurrently. “Our vision at Smoking Gun Interactive has always been to deliver interactive entertainment content in new and exciting ways that push the medium forwards”, said John Johnson CEO and Creative Director of Smoking Gun Interactive, “We are delighted to announce our collaboration with Douglas. His astounding skill in creating compelling narrative is the perfect fit for the themes and scenarios we are introducing in our first property”. 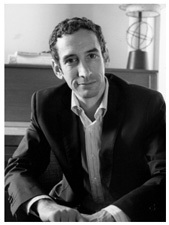 Winner of the first Neil Postman award for Career Achievement in Public Intellectual Activity, Douglas Rushkoff is a bestselling and controversial author, comic’s writer, intellectual, and documentarian. His ten books on new media and popular culture have been translated to over thirty languages. They include Cyberia, Media Virus, Playing the Future, Nothing Sacred: The Truth about Judaism, and Coercion, winner of the Marshall McLuhan Award for best media book. Rushkoff also wrote the acclaimed novels Ecstasy Club and Exit Strategy and graphic novel, Club Zero-G, as well as the recently released Life Inc: How the world became a corporation and how to take it back. 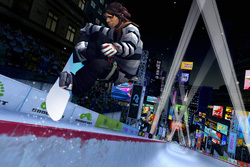 Montreal – Today Ubisoft® announced that it is collaborating again with Olympic Gold Medalist Shaun White in Shaun White Snowboarding: World Stage. Developed by Ubisoft Montréal, the game will be available exclusively for the Wii™ system from Nintendo and will be on store shelves for the holiday season in 2009. Vancouver – Live to tell the tale of becoming a notorious pirate captain or suffer a fate of eternal damnation. Disney Interactive Studios today announced the development of Pirates of the Caribbean: Armada of the Damned, an epic, action role-playing game (RPG) from Propaganda Games, Disney’s video game development studio here in Vancouver. Armada of the Damned is an entirely new experience within the Pirates of the Caribbean universe. 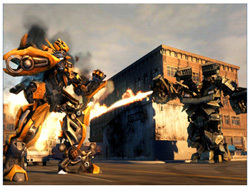 The game takes place before the events of the blockbuster films. Players will take on the role of a pirate and embark on epic land and sea adventures. Numerous moral and character choices will need to be made that affect their character and the original story within the world. Players will explore a massive open world while fighting enemies, mystical creatures and Mother Nature, both to gain experience and stay alive. Supernatural elements familiar to the Pirates of the Caribbean world will also affect their character’s story and influence their choices. Nikopol’s Search for Digital is Over! Montreal – Meridian4 and White Birds Productions are thrilled to announce that they have signed a global digital publishing agreement for their critically-acclaimed adventure title; Nikopol. After re-acquiring the rights for Nikopol from Got Game Entertainment, White Birds are excited to re-introduce the title to a new and larger audience with Canadian publisher Meridian4. “We are very happy to work with Meridian4 on the digital distribution of Nikopol. Not only does Meridian4 have an excellent access to all major distributors, but they also have a real marketing and editorial approach, bringing a lot of added value to the title. We hope that this first partnership will be followed by new ones soon” said Michel Bams, co-founder and VP Marketing at White Birds Productions. Toronto – DreamCatcher Games and JoWood Productions announce that a sequel to the successful SpellForce saga will be released this winter. SpellForce 2 – Faith in Destiny for the PC combines real time strategy with exciting role-play elements. Be part of the story, when all the loose ends tie up in a grandiose showdown between good and evil. Only you can conquer the shadows of the past and reveal the demonic conspiracy. Vancouver – Paradox Interactive and Kerberos Productions today announced an expansion to the critically acclaimed 4X space strategy game series Sword of the Stars. Vancouver – Today Ubisoft® announced a new addition to its sports portfolio, Academy of Champions™, an arcade soccer game featuring legendary sports icons Pelé and U.S. soccer champion Mia Hamm. Developed for the Wii™ system from Nintendo, the game will deliver an engaging, interactive experience for kids and their families. Academy of Champions is scheduled to be released in 2009. 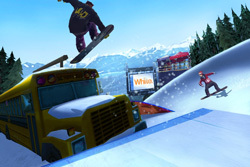 Created by an experienced team of sports game developers at Ubisoft Vancouver, Academy of Champions engages players in a rich, story-driven adventure around the world’s most popular sport. The journey begins with enrollment at an extraordinary Academy where your coach is the legendary Pelé and U.S. soccer champion Mia Hamm is your team member and mentor. Montreal – Activision Publishing, Inc. has assembled an all-star cast for the upcoming Transformers™: Revenge of the Fallen video game, including the film’s leads Shia LeBeouf and Megan Fox, who will reprise their starring roles in the game, and fan favorites Peter Cullen and Frank Welker, the voices of OPTIMUS PRIME and MEGATRON from the original animated series. In the new game, developed under license from Hasbro with Montreal’s Beenox Studio developing the Windows PC version, players are thrust into an adrenaline-pumping battle to defend Earth from a DECEPTICON attack that threatens mankind. Montréal – Ubisoft® has announced that it will launch a new title in the Might & Magic universe. 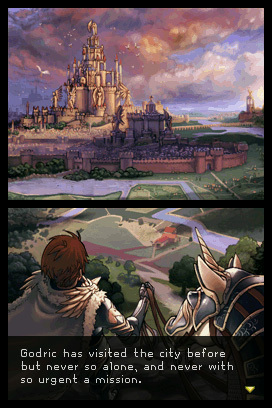 Might & Magic Clash of Heroes, a puzzle RPG, was developed by Toronto’s Capybara Games, creators of award-winning handheld and mobile games, specifically for Nintendo DS™ for release in August 2009.